The birch sap naturally contains about one per cent of sugars, as well as a rich variety of different minerals, vitamins and other antioxidants. Fresh birch syrup perishes quickly (preserves at most 48 hours if kept in a cool place), thus it is essential to process it immediately after collection. The naturally occurring sugars in birch syrup are glucose and fructose, rather than sucrose as in maple syrup. The syrup making process consists of a number of different stages. First, most of the water is removed from the sap at high temperature. Then the concentrate is after-cooked at a lower temperature to avoid excessive caramelisation. 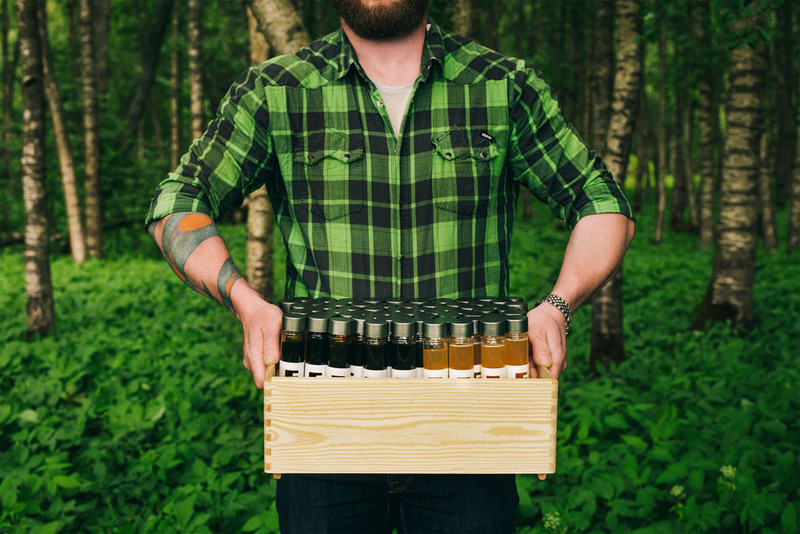 It takes 13-15 litres of birch sap to produce 100 ml birch syrup. We offer syrups in a number of taste and colour nuances, ranging from light, sweet and delicate, to dark and pungent, with morello-like acidity. The qualities of the syrup depend partly on terroir, the natural qualities of the soil and the period of sap collection, partly on the degree to which the sap is concentrated and caramelised. Our lightest coloured birch syrup is produced by evaporating birch sap in a vacuum evaporator on low temperatures only. The syrup thus produced only contains non-caramelised sugar and the taste of the syrup is fresh, delicately sweet and floral. The darker syrups have been evaporated on higher temperatures, foregrounding the rich tangy and woodlandy taste bouquet potent in birch sap.